Have you noticed that you’re missing important parts of conversations or hearing words incorrectly? Does your family tell you that the television is always too loud? You probably know that you could have hearing loss, but feel embarrassed. You might even get angry when friends and family tell you they think you should have your hearing checked. That’s because many people associate hearing loss with getting older and the elderly. In fact, 65% of people who have some sort of hearing loss are actually younger than 65 and back in 2011, a study by John Hopkins Medicine reported that as many as 1 in 5 Americans age 12 and older have hearing losses that impair their communication abilities. Hearing loss is so prevalent that the American Academy of Audiology lists it as the 3rd most common health problem in the United States! You might think that if you really need treatment like hearing aids that your Primary Care Physician would tell you, but most doctors don’t check your hearing during a routine physical and because your Dr’s office is quiet, they probably won’t notice if you have a hearing problem or not either. We understand if you’re nervous, but today’s hearing aids are different. There are so many types and technology has greatly improved. To better convince you, we’ve come up with these 7 benefits to wearing hearing aids. Take a look. There is no cure for tinnitus. However, because most people who suffer from tinnitus also suffer from hearing loss, treating the hearing loss with hearing aids, can actually reduce the tinnitus symptoms and there are now even hearing aids designed specifically for people who suffer from tinnitus. 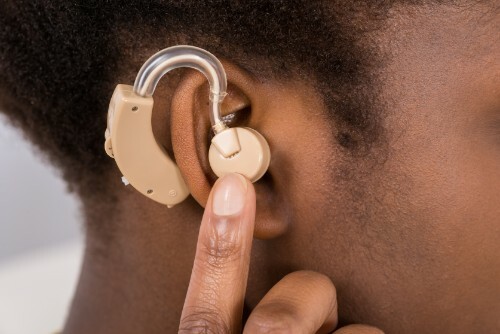 Believe it or not, but wearing hearing aids can actually increase your income. Seriously! According to research by the Better Hearing Institute, treating your hearing loss reduced drops in income between 77% and 90% depending on the severity of the hearing loss. Did you know that not treating your hearing loss actually means you’re damaging your brain! Wow! Numerous research has shown a link between dementia and untreated hearing loss. The reduction in cognitive functioning happens because untreated hearing loss actually causes the part of your brain responsible for hearing to atrophy, in other words, die. However, research also shows that hearing aids actually help slow this effect of hearing loss. Hearing aids can actually improve your mental health and prevent depression. Studies have shown a correlation between hearing loss and depression. When you can’t follow conversations, especially when there’s a lot of background noise, you start to isolate yourself and to avoid activities and time with friends. Getting hearing aids so you can hear and understand what people are saying even in places like parties and sporting events, means you can get your life back again. Do you often accuse people of being angry with you only to have them insist that isn’t the case? Are you often in arguments with your family or friends because of miscommunication? Untreated hearing loss damages relationships because it means you don’t hear what people are saying, and can even mishear their tone. It’s frustrating for you and your loved ones. But with hearing aids, you can hear what people are saying and accurately interpret whether they’re happy, sad, or even angry. That means your communication is improved, thus improving your relationships. When you can’t hear your surroundings, you become nervous and unsure, even paranoid. You might not want to go out and do things for yourself like grocery shopping. Plus, with a severe hearing loss, it’s not safe to drive. That means you have to rely on others to help or that people close to you stop allowing you to do things for yourself anymore. But when you can hear again with help of a device like a hearing aid, you gain greater independence and the confidence to do more for yourself. This last point is really a combination of all of them. That’s because when you aren’t annoyed by tinnitus, have more earning power, are happier, more independent, understand everything being said, and you have healthy relationships, you have a much better quality of life. Hearing aids can really help improve your life in profound ways. So don’t feel bad if you or a family member has noticed you might be experiencing hearing loss. Talk to an audiologist or your doctor and ask for an evaluation. Today’s hearing aids can help you have a life you can hear again. We want to hear from you! Tell us your hearing aid triumphs in the comment section below and if you have any questions about hearing loss and hearing aids, feel free to call us! We’re here to help you hear!